I am as guilty as the next person. I have plain ceilings. I paint most of my ceilings a shade or two lighter that the wall color. In my oldest daughter's bedroom we went for a beautiful light blue and I think it looks nice. 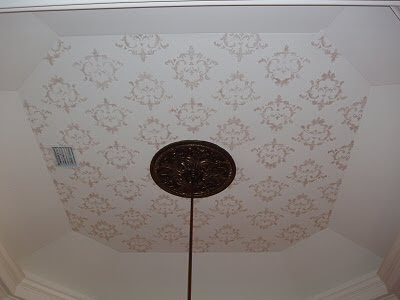 When I had my decorative painting business I painted a quite a few ceilings, especially in kids rooms, with clouds. I even painted a Tinkerbell and Peter Pan scene on one lucky girl's playroom ceiling. Fun stuff, but boy your neck sure hurts after one of those jobs. Most of us don't give much thought to using the ceiling as a showcase in our homes, but many ceilings beg for that kind of attention. So many homes are built with beautiful ceiling details and the decorative painting just adds to the drama that the builder was trying to create. I've decided to feature a few beautiful ceilings for you to admire. Here's a beautiful tropical painted ceiling by artist Kim Goins Kosek. 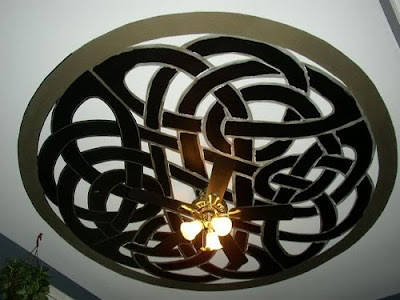 Here's a ceiling that a homeowner posted on a DIY crafter's forum. I don't know who painted this, but I think this is excellent work for a non-professional. It just goes to show that you don't have to pay big bucks to get a fabulous look. I little bit of paint and a lot of patience is needed though. 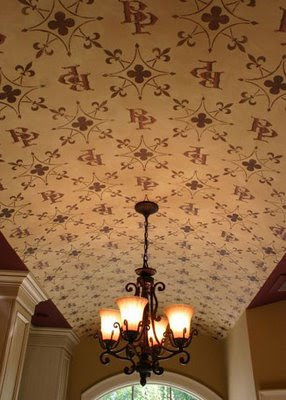 This fabulous stenciled ceiling was done by Faux By Kathy. I love this sky ceiling by Ament Interiors. I have always loved Royal Design Studios stencils. Here's a ceiling done with one of her Modello Designs. Not all ceilings need to be terribly complicated. This simple stencil adds more drama when repeated. Stencil painting by Art Works. 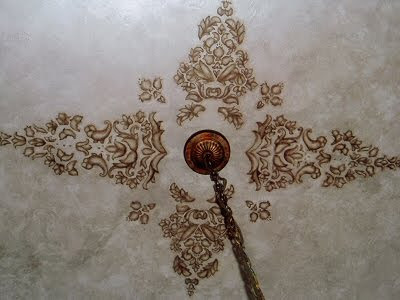 Art Works also stenciled this ceiling medallion over a faux finished treatment. Beautiful right? This makes my plain ceilings look down right under dressed. Which is your favorite ceiling? 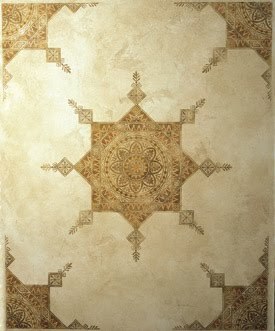 If you have done anything unusual to dress up your ceilings, please comment and tell me about it. Snap...how about that for great minds...you have to check out my post today:-) I love the stenciling. I've loved looking at these ceilings. I'm afraid I still have popcorn ceilings here!! I may be ceiling dysfunctional! I feel like I'm admitting to a serious character flaw...someday, I'll have lovely ceilings.